The culmination of the 2008-2009 Pee Wee B hockey season brought us to Lysander, New York for the JAM Tournament. This tourney, put on by the Snowbelt League, had teams from throughout Central New York competing for both upper division and middle division titles (the lower division of the Snowbelt played their end of season tournament in Auburn). Michael and Jill drove up on Friday during the day for the Sens game against the Rome Grizzlies. Nick played in this game, which the Sens won easily 7-0. After the game, they drove back to Binghamton. Bright and early Saturday morning, the three of us headed back up to Syracuse. The first game of the day was against 'Camillus 1', the second best team in the Snowbelt during the 08-09 season (second only to our Sens!). Michael played this entire game, shutting out the Cougars 1-0 in what was probably his best effort of the season. Back to the hotel to eat and rest before the second game of the day. Being a goalie parent can be quite stressful most days, and after watching Mike shut out the Camillus 1 team in the morning, Jill and I dropped Michael off at the rink and went to Wacky Wyatt's BBQ in Baldwinsville to grab a couple of drinks and watch the end of the SU game on TV. We figured 'eh, what the heck, Mike played this morning so Nick will get the start this afternoon'. Boy, were we surprised when we got back to the rink to find Mike in net! This game was against Camillus 2, and featured a goalie for the Cougars that could politely be described as a nemesis, but better described as one of the worst sports we've ever seen. He was an adequate goalie, but this was overshadowed by his antics on the ice throughout the game. The Sens prevailed though, and Mike earned his second win of the day beating yet another Cougars team by the score of 7-3. Back to the hotel after the game for dinner and a good nights sleep (for the boys). On Sunday, through a last minute alteration in the rules by the Snowbelt league, the Sens faced Geneva (yes, that Geneva team). Nick played the entire game, and this one proved to be a bit cleaner than the last time Jill and I watched both of these squads play each other. The highlight of the game was a clean, open ice hit by Kathryn Darling on '#10' from Geneva - the same player that went after Zach Peete and Michael in the game earlier in the season in Geneva (yes, that game). As told to us by one of the Sens players, even the referee said 'wow, she laid him out'. Thankfully, he was okay, the game continued, and the Sens came away with the easy win. 8-0 was the final. Once again, back to the hotel after the game for lunch (although, Jill and I decided to head next door to Quaker Steak and Lube for lunch instead, and Mikie tagged along). One last game in the Snowbelt awaited the Sens later Sunday afternoon. The championship game would pit the Sens versus Camillus 1, a team that they shut out (thanks to Michael) the day before, and a game that would feature number 1 versus number 2. Nick had the start, and played the game, and the Sens skated away as the 08-09 Snowbelt Pee Wee Division Champions by defeating the Cougars by the score of 4-3. We made another stop at the Quaker Steak and Lube for dinner (we had promised Mike he could go there) and then we drove back home afterward. 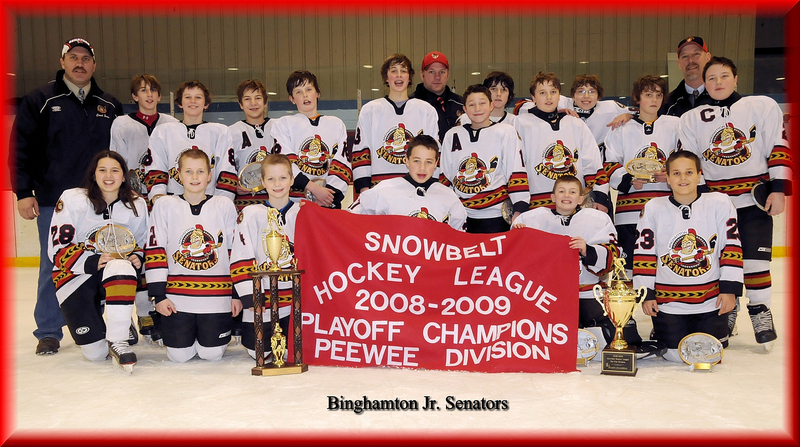 The 2008-2009 Snowbelt Pee Wee Champs - Binghamton Jr. Senators!